Dog treats serve several different purposes. They can be used to spoil your pup or reward him for a job well done. Treats are needed for dog training, housebreaking and behavioral work as well. No matter what you're using them for, because their calories can add up quickly, it's important to use best low calorie dog treats to keep Fido from gaining excess weight. Low calories aren't the only thing that you should be looking for when shopping for healthy dog treats. Ideally, the treats aren't full of empty calories and contain nutrition that's beneficial to the dog. The best low calorie dog treats will contain wholesome and natural ingredients, no fillers or artificial ingredients that could be harmful. * Click on the best low calorie dog treats for more information, prices and details. Scroll below to read reviews. As pet owners are beginning to be more conscious of the ingredients in their dog's food and treats, manufacturers are starting to focus on producing healthy dog treats made with top quality ingredients. Unfortunately, recent studies show that many commercial dog treats contain “undefined” ingredients, like sugar, which exceed the recommended daily energy allowance for the dog. You cannot simply choose a product based on name recognition or price alone. Companies that sell inexpensive dog treats tend to use poor quality ingredients. The treats cost less to make, so they can sell them at a much cheaper price point. Likewise, some of the most well-known brands are only popular because their products are inexpensive. In order to choose a healthy option, it’s crucial that you pick healthy dog treats with USDA certified ingredients. Through US laws, the USDA inspects products, companies and their practices with strict standards. It's also important to look for dog treats that meet the standards provided by the U.S. Food and Drug Administration (FDA). Dogs are always up for a snack, which makes it easy to overfeed them. Dog treats are small, and most dogs gobble them down in just a few seconds. 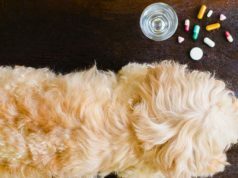 While it may be tempting to give your pooch a few treats at a time, it could actually be very damaging to his health. In this NPR article, veterinarians explain how often pet owners forget to account for the caloric intake from dog treats, and end up with an obese pet in the end. Dog treats should only make up about 10% of your dog’s daily calories. That's not much. For most dogs, that's only a few of the best low calorie dog treats each day. Sticking to this guideline is important, because you don't want your dog to gain unnecessary weight. Not only will your dog lack energy and have a harder time completing his daily tasks, obesity in pets can lead to a number of very serious diseases. Keeping your dog in shape is one of the best things that you can do to keep him healthy. You don't need to cut treats out all together. Just be sure to choose a low calorie option and give your pup treats sparingly. Remember, treats do make your dog happy, but they only last for a few seconds. Your dog would enjoy a game of fetch, a short walk or a tummy rub much more than a handful of dog treats. What are the Best Low Calorie Dog Treats? The Honest Kitchen’s Fish Skin Chew Dog Treats is a one-ingredient treat made from dehydrated, wild-caught catfish skin. Since there’s only one ingredient in it, it’s a great option for dogs that are sensitive to a lot of ingredients. Catfish is very high in protein, low in fat, and low in total calorie content. Treats are given sparingly, so the high protein count will not affect your dog’s diet that much. This treat contains at least 88% crude protein, 4% crude fat, and a maximum of 0.2% fiber. No artificial preservatives or GMO-derived ingredients were used in the manufacture of The Honest Kitchen Fish Skin Chew Dog Treats. You can rip these strips into smaller pieces to use for training purposes or to give your dog multiple treats throughout the day. These long strips of dehydrated catfish skin make great snacks and training treats. They’re good for the gums and teeth, because they’re hard chews, but not the hard and dry type that your dog would choke on. They are not messy on the hands, unlike the soft ones. 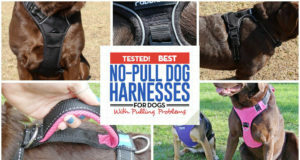 The handy packaging makes it easy to bring along when you’re going out with your dog to train. Old Mother Hubbard Crunchy Classic Natural Dog Treats is a bagful of surprises with an assortment of oven-baked mini biscuits in original, chicken, cheddar, and char tar flavors. They’re crunchy and bone-shaped, and dogs love the element of surprise with each differently-flavored reward they get. Ingredients: Whole Wheat Flour, Oatmeal, Wheat Bran, Chicken Fat (preserved with Mixed Tocopherols), Chicken, Cane Molasses, Turmeric, Paprika, Eggs, Apples, Carrots, Garlic Powder, Salt, Paprika Extracts, White Cheddar Cheese, Bone Charcoal, Mixed Tocopherols added to preserve freshness. These tasty biscuits are made of natural and wholesome ingredients, including real chicken, cheddar cheese, whole wheat flour, eggs, apples, carrots, and turmeric. The Original Assortment variation contains 12% crude protein, 7% crude fat, 5.5% crude fiber, and 3275 kcal of metabolizable energy per kg. The nutritional profile of Old Mother Hubbard Crunchy Classic Natural Dog Treats shows a good balance of calorie distribution per nutrient and should not interfere in your dog’s diet in terms of calorie intake. These treats are soft and crunchy, so they won’t damage your dog’s teeth. They’re just the right size to stuff inside food dispensing toys for dogs to explore and spend time in. With all four flavors in there, your dog will never get bored of Old Mother Hubbard’s Original Assortment dog treats. Fruitables Skinny Minis Apple Bacon treats are small fruity chews perfect for training small dogs. These treats also have very low calorie content that they’re favored by calorie conscious dog owners. The ingredients used in making these fruity treats are sweet potatoes, oatmeal, brown rice, real bacon bits, apples, and rosemary. Each pouch contains 100 flower-shaped apple-and-bacon flavored chews that pets would find irresistibly tasty. A kilogram of these treats contain 2691 kcal of metabolizable energy, with 5% crude protein, 4% crude fat, and 4% crude fiber. They’re aptly called Skinny Minis because each piece of treat contains only 2 calories, so Fruitables Skinny Minis Apple Bacon Dog Treats really won’t make a mess of your dog’s dietary regimen. Treats are usually meat-based so this fruity chew is a welcome change to many dog owners and their dogs. It’s also free from wheat and corn, so it’s a good choice for dogs allergic to those ingredients. For dogs getting more than their share of protein from their meals, this low-protein treat would be perfect. Pet Botanics Training Reward is made from real pork liver, which is this treat’s first ingredient. There are over 200 pieces of meaty chews in a bag which are the perfect size to use as positive reinforcement during training. Each piece only contains 1.5 calories which is low enough even when you’re planning to use it as repetitive reward. Crude protein content is at least 12%, crude fat content is at least 7%, and crude fiber is 4% maximum. The total calorie count is 3120 kcal per kg. Moisture is unusually high at 30% and that shows in the consistency of Pet Botanics Training Rewards, which is soft and luscious. 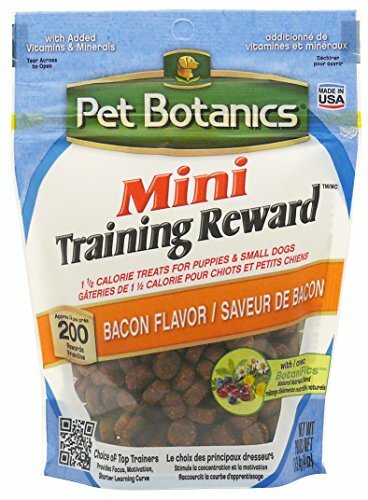 Pet Botanics Pet Reward treats are the perfect size for rewards because a few pieces don’t take up so much time and attention for a dog to chew while undergoing training. They taste and smell so delicious, too, and provide dogs with the proper motivation. Charlee Bear dog treats are low-calorie treats made from real liver and wheat flour. Each round piece has about 3 calories in it. This is the dry type of treat that you can put inside your pocket when you’re with a dog to train. Unlike the other moist and chewy treats, these pieces will not stick to your fingers or melt in your hand. The metabolizable energy in every kilogram of Charlee Bear Dog Treats is 3160 kcal, with 18% crude protein, 3% crude fat, and 5% crude fiber. That’s considerable protein but also low fat, so these treats are good for those dogs in weight control program. Apart from Charlee Bear treat’s use as a reward, its good size is also great to stuff inside dispensing toys or give to dogs as just plain snacks. This treat can get too crumbly, though, which can distract dogs when they have to pick up broken pieces from the floor. Aside from that, it’s a good low-calorie treat to have for your dog. Get Naked Low-Calorie Dental Chew Sticks will be the obvious choice of dog owners looking for dog treats that are grain-free and low-calorie. It’s the perfect combination when trying to keep the pounds off pets that also happen to be allergic to grains. Dental chews are also good for removing plaque and tartar and keeping the dog’s breath fresh, so this is a huge plus. These dental chew sticks are made from potatoes, chicken, carrots, flaxseed, chia seeds, apples, cranberries, and other natural ingredients. Get Naked Low Calorie Dental Chew Sticks for Dogs contains no added sugar, and that’s great news for diabetic dogs. It contains 2950 kcal per kg with 20% crude protein, 2% crude fat, 3% crude fiber. This treat is great as snacks for your dog. A stick would take a while to finish, and it’s unlike the smaller reward treats that you give repeatedly. So the calorie intake from this treat would not significantly impact on your canine’s restrictive diet. It has added L-carnitine, too, which enhances the capacity of the body to burn calories. Nothing could possibly be a better treat for diabetic and obese dogs than these Get Naked chew sticks. Zuke’s Mini Naturals Chicken Recipe Dog Treats are chewy meaty treats that are also low-calorie. This treat is made from chicken, rice, barley, sunflower oil, turmeric, cherries, and herbs. It does not contain corn, wheat, or soy. There are five variations available – salmon, peanut butter, duck, pork, and rabbit – which keep dogs from getting bored with Zuke’s Mini Naturals dog treats. The treats are small in size, so they’re perfect as rewards for training. Each piece contains less than 3.5 calories. A kilogram of Zuke’s Mini Naturals Dog Treats would contain 3640 kcal of metabolizable energy, 10% of which is crude protein, 7% crude fat, and 2% crude fiber. 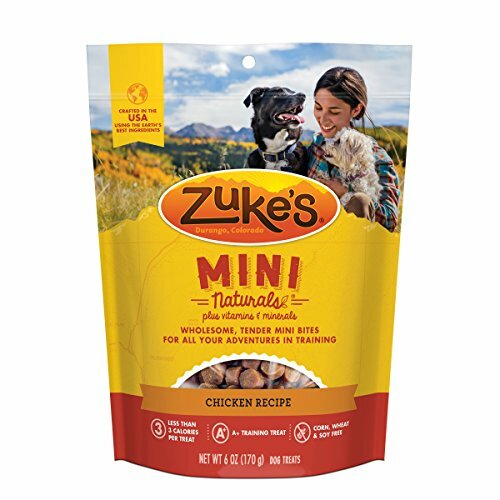 Zuke’s is a great option when looking for training treats, especially when you have a dog that gets all the rashes with the slightest hint of corn or wheat in the ingredients. This would keep him or her motivated without the skin irritations or the unwanted pounds.